Oranges are well-known and the most common fruit around the world. This fruit is popular owing to its easy availability all the year round, high in nutritious value, and for good taste. Oranges are the round type of citrus fruits, ranging from 2-3 inches in diameter, superb textures in pulp and orange colored in the skin. Its pulp is very juicy. The thickness of an orange’s skin depends on its variety. Oranges taste can be sweet, sour and bitter. So you need to know the variety before buying it. The sweet type of oranges is typically more fragrant. Navel, Valencia, and Jaffa oranges are perfect for making juices. Other types of oranges include Mandarin, Clementine, tangerine, Minneola, kumquat etc. What Vitamins are in Orange Juice? Orange can be an outstanding source of flavonoids and vitamin C.
You can get 100% of daily required vitamin C from an orange (130 grams). The albedo (white material under the skin) contains a great volume of worthy bioflavonoids and other anti-cancer properties. Moreover, oranges are a good source of nutrients such as A and B vitamins, beta-carotene, amino acids, potassium, pectin, iodine, folate, calcium, phosphorus, zinc, sodium, chlorine, manganese, and iron. The arrangement of the high volume of flavonoids and antioxidant in oranges makes it as the best fruits for the human body. Calories in a large orange are filled with above 60 flavonoids and 170 different phytonutrients. Many of them revealed to have anti-tumor, anti-inflammatory, and blood clot preventing properties, along with having powerful anti-oxidant effects. 1. Cancer Prevention: Oranges contains a compound called “liminoid”, which fight against skin, mouth, breast, lung, colon and stomach cancers. The high amount of vitamin C content works as a good anti-oxidant that saves cells from free radicals damages. 2. Cholesterol: The “Alkaloid Synephrine” under the orange peel can prevent the liver’s to create cholesterol. The anti-oxidant properties in oranges can fight against oxidative stress, which is the main criminal in oxidizing the Low-density lipoprotein in our blood. 3. 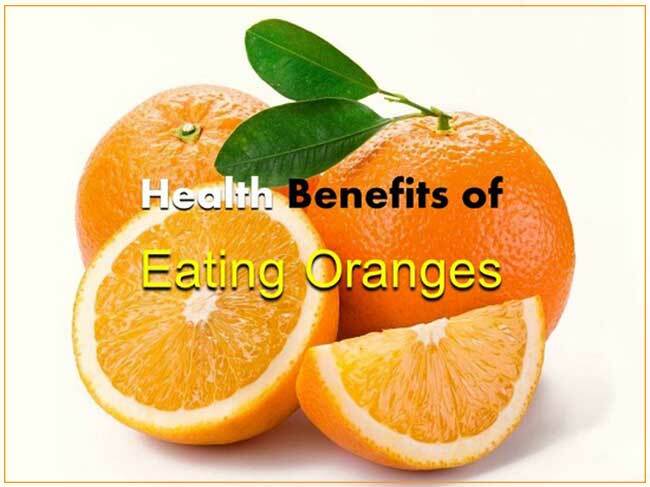 Repair Damaged Cells: Eating oranges a day can keep someone’s cells to be healthy. An antioxidant (Vitamin C) protects our cells from genetic damage, which occurs a birth defect. 4. Constipation: The “tastes acidic” in oranges has an alkaline effect that helps our digestive system to stimulate the digestive juices to relieve constipation. 5. Heart Disease: Eating oranges regularly (A high volume of vitamin C and flavonoids) can decrease the possibility of heart diseases. 6. Control the Blood Pressure: Studies have proven that “hesperidin” in oranges can decrease the high blood pressure. 7. Good Immune System: The high amount of anti-inflammatory properties (vitamin C) in orange helps white cells to fight infection, for this reason, you can build a good immune system naturally. 8. Skin: Anti-oxidant in orange help to save our skin from free radical damage, which is responsible for occurring the aging process soon. 9. Prevent Kidney Stones: Try to drink orange juice on a regular basis. It will decrease the possibility of creating calcium oxalate stones in the kidney. 10. Stop Stomach Ulcer: Eating oranges every day can help to lower the risk of peptic ulcers, decrease the possibility of stomach cancer. 11. Protect against Viral Infections: The great source of polyphenols have been revealed to give protection against viral infections, which we can get from oranges. There is no doubt that oranges contain many health benefits, but keep in mind to eat in moderation. Too much drinking of orange juices can strip calcium from the body, occur to teeth and bones decay.